A little bird told me you were wishing for a bit of spring! Me too!!!! Every morning I put my boots on and go out to feed the birds. Don't forget them. Their food is hidden by tons of snow here. On the morning news it looked like everyone in Houston was ice skating on the highways with their cars. Way to much fun for me! I'll take snow over ice any day of the week. Woo hoo... both quilts look fabulous. Thank you for the pattern. This is the perfect quilt to make for one of my children - Sandra. Today take a trip to Bunny Hill Lane for a bit of pillow talk with Anne. She's giving away something to press out all of your troubles. a lot of fun with the prize !! Congratulations to Laurie and Sandra. The fabrics are so pretty and the quilts will be lovely. I can hardly wait to see the finished product. 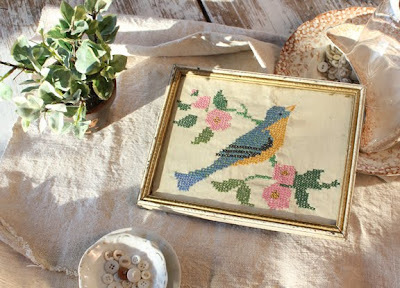 Alma, I love the bird cross-stitch in you picture. It says Spring so well. Have a good day everyone. Congrats to the winners!! The fabric is beautiful!! Ok, that's pretty neat -- I know both of the winners! Congrats to them! Lucky! I have been hearing the birds singing this week, even with all the snow, maybe spring is coming, lol. pictures, we all would like to see pictures!! Thank you so much Alma. I am in total shock. I never seem to win anything and this prize is wonderful. - Sandra. Congrats to the winners! 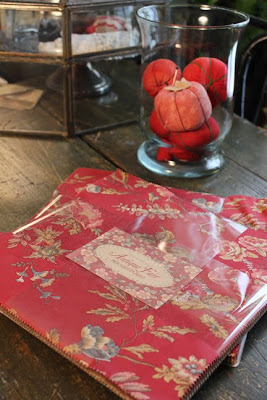 Alma, I can't wait til this fabric line is out. I love the basket quilt and want to make it. I was wondering if you could tell me where you guys find your trims. 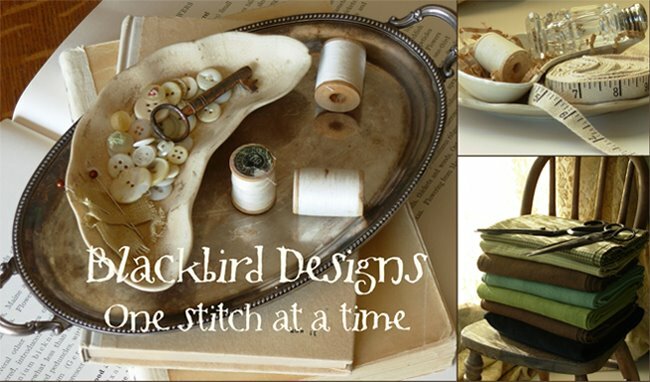 Like the chenille trim you used in the last book for the pin cushion? Also any other trims you guys use. I went to Hancocks fabric today with a list of things to get to make the pin cushion and came out with nothing. They have no cotton stuffing either, only polyester. Thanks! I can't wait to see the new cross stitch book either. I'm always excited to see what you two have for us. Oh WOW... I won a layer cake! Thank you so much Alma. I'll be sending you my address. Congrats! Please post photos of the finished quilts!! I don't understand your pattern for Antique Fair Baskets. The supply list calls for 1 fat quarter each of 3 light prints, and 1 fat quarter each of 3 dark prints. I don't know where these are used, since it seems that the layer cake takes care of all the fabric needed for the basket blocks. Help, please? I e-mailed Barb to answer questions about the supply list. There are certain prints in the layer cake that did not have enough contrast to show when mixed. I added some dark wine colors for contrast. There are 42 prints in a layer cake--I believe that would do 21 blocks---and there are 25 basket blocks in the quilt. I don't work as tightly with fabric that others may, so I added extra so I would have enough fabric to work with. And it never fails, my rotary cutter slips while cutting and I ruin a piece or two. Congrats to Laurie and Sandra. What a great bluebird. Hope you thaw out soon! I love the cover of your new book and can't wait to see it in the shops! Hi Alma and Barb! Just wanted to tell you how much I enjoy your blog and everything that you do! Your pillow was wonderful and I genuinely enjoyed learning more about you Barb. Happy Valentine's Day to you both! Help, I ordered one of your patterns "Midnight Silhouette" and after a few weeks the seller refunded my money. I have looked everywhere on the Internet and can't find this pattern. Is it going to be republished ... please?